Buy this item and earn 543 ClubPoints. 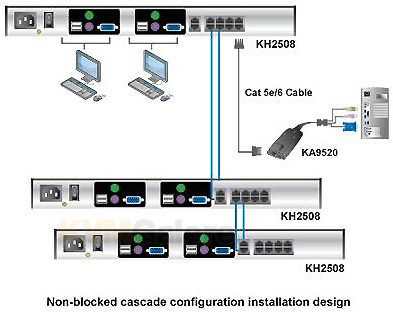 KH2508 CAT-5 KVM switch is a dual channel device, allowing two operators to independently and simultaneous access up 8 directly connected computers, and up a maximum of 512 servers through three level cascading. 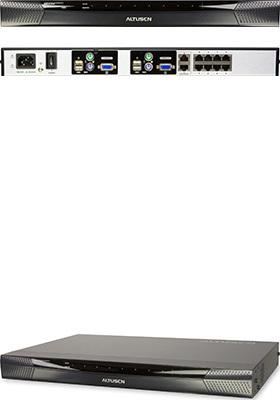 Cascading is achieved via dedicated RJ-45 cascade ports and CAT-5e cabling. Both, first level consoles are able to access all 512 computers in the installation, on the second tier, one console can access second and third level servers, and one console on the third level can access third level servers. Security consists of two level access (Administrator and User) password / user name protected. The Administrator can set user access on a port-by-port basis, and as many as 96 user accounts can be created. The CAT-5 connections allow servers to be separated from the KVM by up to 130 ft. with a maximum video resolution of 1280x1024 @ 75Hz. The KVM supports mixed environments of Windows, Mac , Linux, Unix, Novell, and OS/2 and employs keyboard emulation for special Mac and Sun keys.